This is a new fine art print work by John Olsen titled “MT Kenya”, it is a limited edition quality fine art print signed and titled by John Olsen, a edition has been limited to 65 only, the sheet size is 59cm x 44cm this Edtion now finished, a larger version 80x61cm is also available. The print “Mt Kenya” is made on high quality Arches archival paper using the best quality technology affordable. 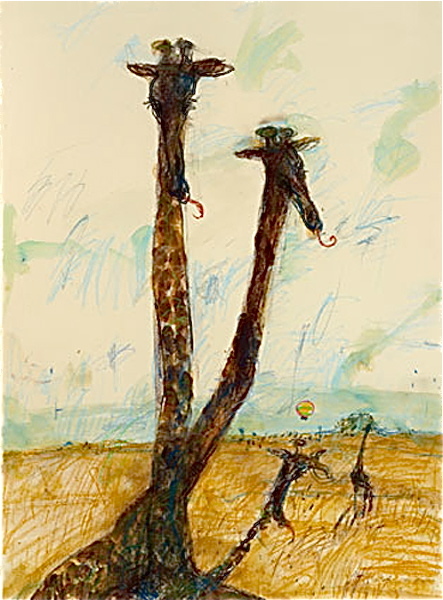 John Olsen as have other artist, felt these mostly Australian fine art edition prints are a way for art lovers to be able acquire an affordable piece of his wonderful fine art works as there is only one original painting, works on paper or water colour. John Olsen’s traditional fine art etchings prints silkscreen’s Lithographs have so far made it possible to let the public enjoy his work, how ever now with the Australian fine art edition quality prints they can enjoy his fine paintings, watercolours and mixed media works on paper even more so. Etching House has in stock John Olsen limited edition fine art print titled “Mt Kenya” another 2 are coming in soon.